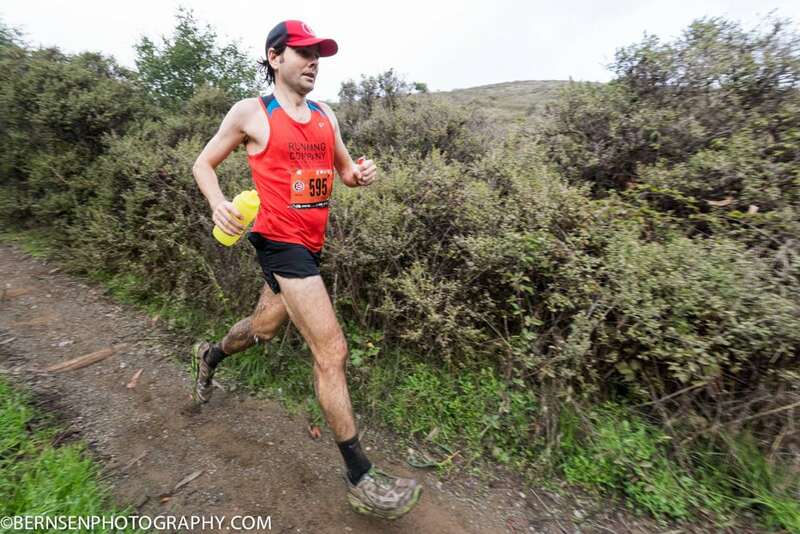 Chris DeNucci finished 20th male at the 2015 Western States 100. Then, in 2016, he finished ninth, and, in June, in the race’s 2017 edition, he improved to a fifth-place finish. A radiologist at Stanford University by trade, DeNucci understands that success—in running, academics, or life—is the result of a process. But the San Francisco Bay Area, California resident may never have discovered his penchant for endurance events if not for an intestinal disease that led to serious health issues, complicated surgeries, and a book about the Appalachian Trail. Suffice it to say that his path to the track in Auburn has been an interesting one. Put up your feet, listen to this audio preview, and then read on to learn about the bearded doctor, Chris DeNucci. iRunFar: You grew up in a military family. Chris DeNucci: Yeah, every time I tell people that, people ask, ‘What branch?’ Like my dad was on the front lines in a tank or something [laughs]. He was a dentist in the military. Still, it’s a vital part of the healthcare system within the military. Growing up, we moved around quite a bit. I was actually born in Arizona. We lived in Texas, Maryland a couple times, Alaska—so, I kind of got a taste of everywhere throughout the U.S. It was an interesting childhood. iRunFar: Did your family stay active? DeNucci: I grew up in a pretty active family. I was encouraged to play sports but I was also really interested in sports. I played all sorts of sports. My sisters were always really athletic too. It was kind of part of our family. It was never on a super-high level but we were all doing that stuff because we liked to be active. I remember growing up that I really wanted to be a professional hockey player and a professional baseball player. This was at the time when these dual athletes were coming out, like Bo Jackson and Deon Sanders. I remember wanting to be something like that, a jack of all trades. My parents were the type that woke up every morning and took the dog for a run for three miles. My dad was one of these early marathoners in the late ‘70s, early ‘80s. Not everyone was doing it then. They were the guys who wore minimalist shoes and if you drank water [during a run], they thought you were weak. So, I was exposed to that, though I didn’t necessarily aspire to it at that time. In thinking back, I was surrounded by that. As a kid, Chris DeNucci pursued his first passion, hockey. All photos courtesy of Chris DeNucci unless otherwise noted. iRunFar: What was it like to move around so much as a kid? DeNucci: As a kid, I thought it was awful [laughs]. It was uprooting from friends and stability. Often in a military family, it’s one place for only a year or two. You meet people, get into a school, and then you get assigned to a new place. It was tough as a kid. You don’t fully understand these things as a kid, either. I remember when my dad got assigned to Alaska, I really thought we would live in an igloo because that’s what I had seen in cartoons [laughs]. It’s really the unknown, as a kid—it was scary. 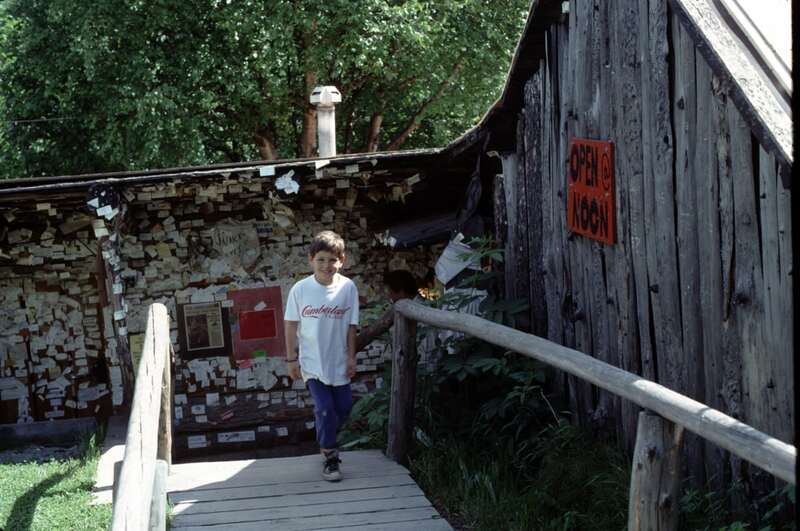 DeNucci in Alaska, one of many places he lived as a kid–and not inside an igloo. iRunFar: To jump ahead, do you think the unknown became familiar, and that’s why you got interested in ultrarunning? Ultrarunning is a lot like a quest into the unknown. DeNucci: That’s an interesting question. I had never thought of it in that context. But, you know, getting uprooted all the time, fitting in was never easy, but once you do it, you have a sense of accomplishment. You go to the unknown, you conquer the fears of showing up in a new place with people you don’t know, and then after you’ve been there, you feel like you’ve overcome that fear. Ultras are very much like that, going into the unknown, especially as you start going to longer distances and doing more difficult courses. You don’t know if you’re physically or mentally able to do it. It’s not until after the race that you get that satisfaction, after you experience the challenges and the hardships during it. Maybe it’s that post-race satisfaction that keeps you coming back, and maybe I did get a taste of that as a child in a different setting. iRunFar: Did you learn anything from moving around all those years? DeNucci: One thing it allowed me to do is adapt to different situations and handle different situations and meet people and try to fit in and find commonality with people who have different backgrounds. I think I did that a lot through athletic endeavors. I went to three different first grades. And it was always, Who’s the fastest kid at recess or in gym class? If you could excel in those areas, you could more easily make friends. 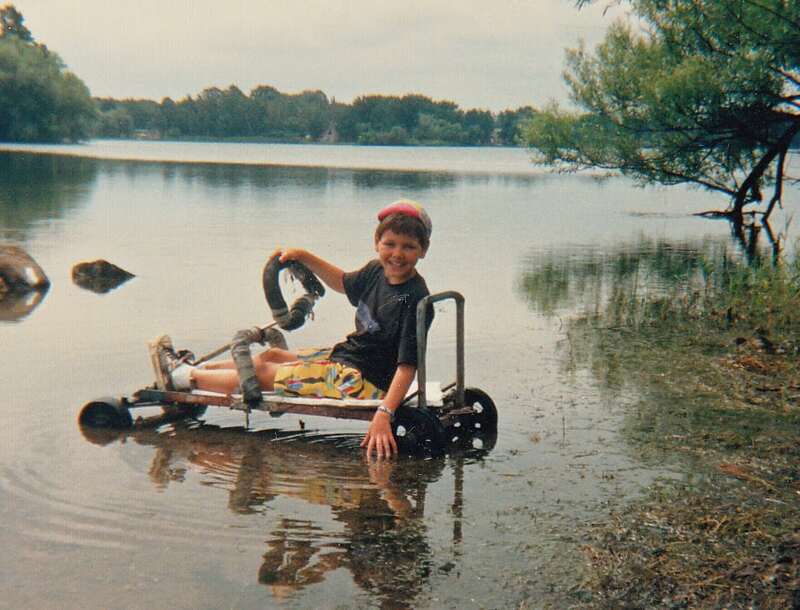 I remember racing people and trying to do that as a kid—play baseball or soccer or whatever it was at the time. 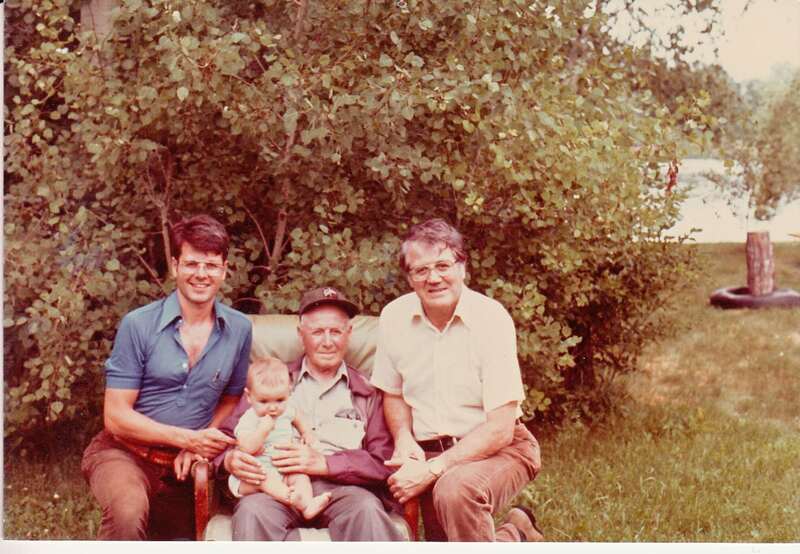 Four generations of DeNucci men smile for the camera, circa 1980.
iRunFar: Did your racing at the playground as a kid develop into your formal running habit now? DeNucci: [laughs] Well, that quickly dropped off, as far as running. Maybe it went into other sports, but I think as I got older I developed different skills. Like intellect—you can use that to fit into different groups and meet people. I was in one place for most of junior high and high school. Throughout that time, I wasn’t having to jump into new groups and meet people. I think, at that time, I was still interested in sports—I did soccer, baseball, and hockey. I loved all of those sports and never pursued running in its own sense. I had dreams of pursuing those sports at a higher level but it became apparent that that wasn’t going to happen. I tried out for the club hockey team in college and was quickly rejected [laughs]. 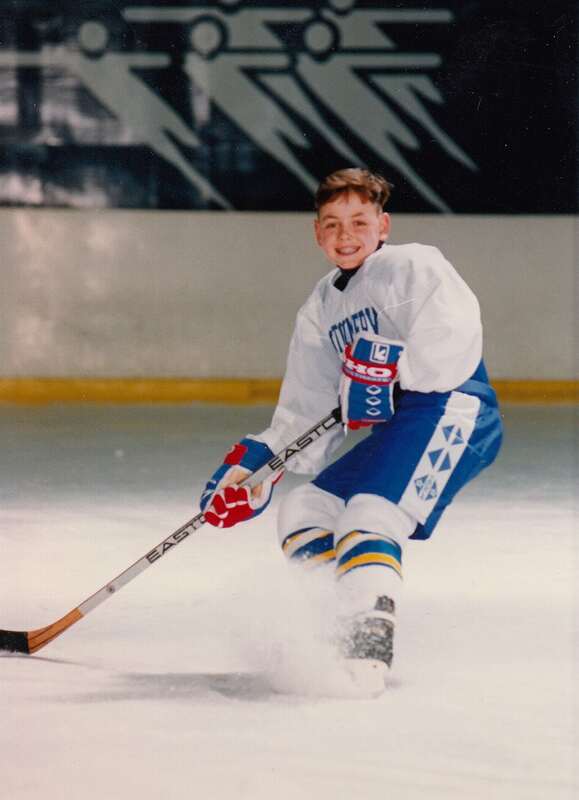 My body never really grew into hockey [laughs]. So, I started to lean more towards academics to advance and get to higher achievement in my life. iRunFar: Right, you’re a doctor. How did that happen? DeNucci: I was exposed to the medical field because my dad was a dentist. So, I wanted to be in medicine or an engineer—those are the two things I was thinking about. I found Penn State, which is a big school with a lot of majors, good programs across the board. In college, when I wanted to pursue something at a higher level, I focused on academics and worked really hard. I enjoyed that. I enjoy working hard and having a result from that. I’d say that’s true with everything in my life—I work really hard at doing well. It was a lot of hard work academically and I balanced that with a lot of play outside of that [laughs]. At that time, I really didn’t do anything physically. The most activity I had was probably walking to the tailgate on Saturday morning [laughs]. It was definitely a different time period for me. 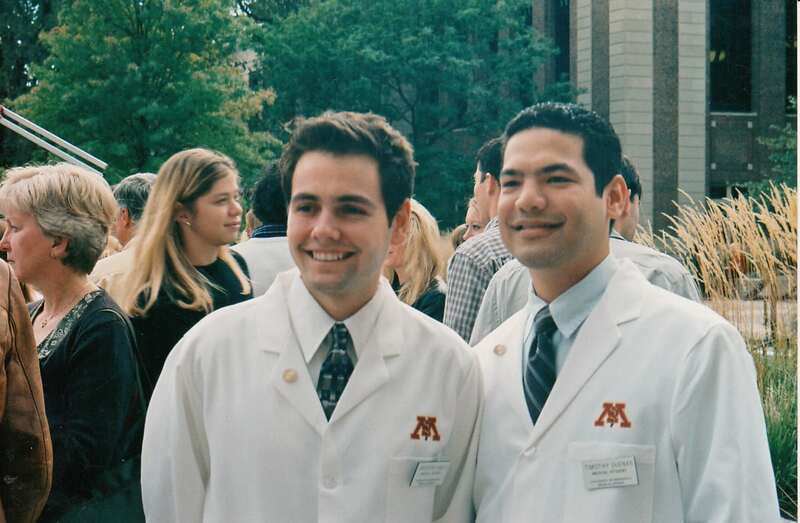 DeNucci (left) starts medical school in 2003.
iRunFar: Maybe that’s why you’re drawn to running—you work hard at X, Y, and Z, and you get the desired outcome. DeNucci: Yeah, that’s definitely a part of it. I think the cool part about running—I was just thinking about this today on a run—I actually love running for the sake of running. Even if I didn’t have competition, I would still do it because it gives me benefits, physical and mental. I think part of it is that it gives me—the training part of it, the goal-setting, putting in the effort, and the cherry on top is that you get to go race. It’s a culmination of all your work, and you capitalize on it. But racing isn’t a major part of why I run. iRunFar: Let’s talk about how you got into running. DeNucci: I guess that’s a little complicated [laughs]. As I was going through college, I started to have some bouts of pretty serious illness, and that’s when I was diagnosed with ulcerative colitis. Eventually, things got bad enough that I went to an emergency room in college to get evaluated because I was having blood in my stool. This had been going on for years but it was getting worse and worse. They diagnosed it and I started on some medication. Quickly, I got much better. I thought I was done with it. I thought, If I work hard and do all these things, I can outthink this and beat this. So, that was happening throughout college and it kept coming back, I kept getting flares of the disease. I was getting pretty sick and having a lot of the symptoms. iRunFar: What were those symptoms? DeNucci: It’s a disease where your body’s immune system starts attacking your large intestine. It sees something foreign within your large intestine—it’s on the spectrum of an auto-immune disorder—and when you have a flare, your immune system is somehow being triggered against your gut, and there’s inflammation in your large bowel. So, you have really bad diarrhea and blood. It’s embarrassing. It’s not something people want to talk about. It also isolates you because you’re so worried about finding a bathroom that you might not want to go out or hang out with people; you might not want to go to the mall or take a long drive. It’s a major quality-of-life issue. iRunFar: Were they able to cure the disease? DeNucci: Well, they needed to do surgery. I was completely against it. I thought there were other things I could do, I thought I could beat it. It probably pushed me even more into going into medicine though, and to doing research. Anyway, I just kept getting sicker and sicker, no matter what I tried. iRunFar: When did you have the intestinal surgery? DeNucci: I was in an eight-year MD and PhD at the University of Minnesota. I was a year and a half into it, and I was having one of the worst flares. I couldn’t even keep weight on. You’re maybe having to go to the bathroom upward of 30 or 40 times a day, and you’re losing blood. A normal weight for me is probably 150 or high 140s. I was down to 110 pounds. They sent me home after they put in what’s called a PICC [peripherally inserted central catheter] line—it was a catheter into my vein, which basically put nutrition into my vein for three weeks. I wore a backpack with nutrition in it that I would turn on once or twice a day. It fed me electrolytes, sugars, fats, proteins, and everything I needed. I was also supposed to eat as much as I could. Before intestinal surgery, DeNucci was fed calories through an IV. iRunFar: That must have been difficult. How did you deal with it? DeNucci: It made me change my perspective about my life. I was finally confronted with the fact that I couldn’t beat this disease, mentally or through whatever I tried. For me, it felt like a battle and I was very resistant. I hated having ulcerative colitis and needing surgery. It was kind of like having to admit failure. It was really hard for me to realize I couldn’t overcome it. I was trying to make peace with that and move forward with my life. You never know though. 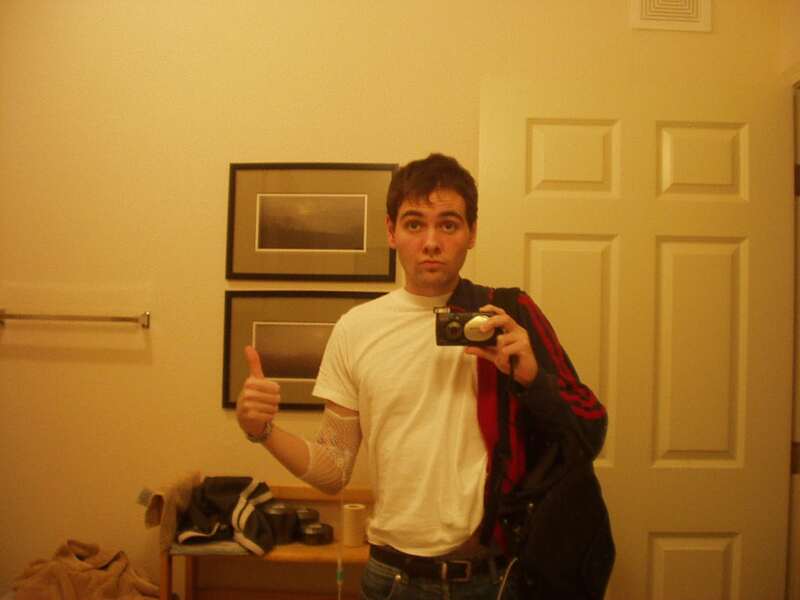 The plan was to take out the intestine, which they did, and then I was left with an ileostomy, which is the bag. Six months later I had the second surgery to hook the small intestine back up. But I was re-hospitalized a couple times with bowel obstruction. It was scary, but when I finally got done with the second surgery, I was so excited to function again as a normal person. iRunFar: But the surgery went well enough and you recovered quickly? DeNucci: I woke up from the second surgery and it was terrible. I always say it was the worst day of my life. I was in terrible pain. I had a big incision in my lower abdomen. I was throwing up and I was sick. I had all these tubes coming out of my abdomen. I had a high dose of pain medication. I was anxious. It was this perfect storm of drugs. I felt like I was hallucinating, I was seeing little men crawl on me. Then right at that time, there were like three or four clowns who walked into my room. I totally thought I was hallucinating. I was like, Oh, my god, this is not good. These clowns come in, they put a red nose on me, and a clown hat. I didn’t believe it was happening. 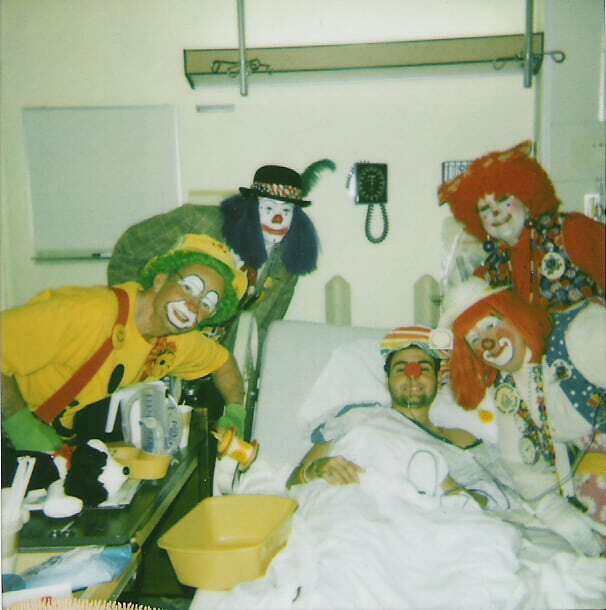 It turns out, they were visiting rooms in the hospital trying to cheer people up. I thought I was just having a hallucination. It was this moment I looked back afterward and thought, Even when you’re going through the worst stuff, there are things you can look back and laugh at. It was such a surreal moment [laughs]. iRunFar: So, you recover from this serious surgery. You’re still not a runner yet. How does that happen? DeNucci: Before the surgery, you’re seeing your life and thinking, Okay, this is what I’ve done so far. Tomorrow may be my last day. It gets you thinking about what things you might want to do in life. I started rethinking my life. It’s not that I was going to change paths completely, but what other things in my life can I pursue? There’s no better time than now to try. When I was recovering from the surgery, I read some books that rekindled some interest that I had as a kid—this interest to pursue something physical like a sport. I had kind of put that in my back pocket. The first book I read was A Walk in the Woods by Bill Bryson. He talks about going from the couch to hiking the Appalachian Trail. 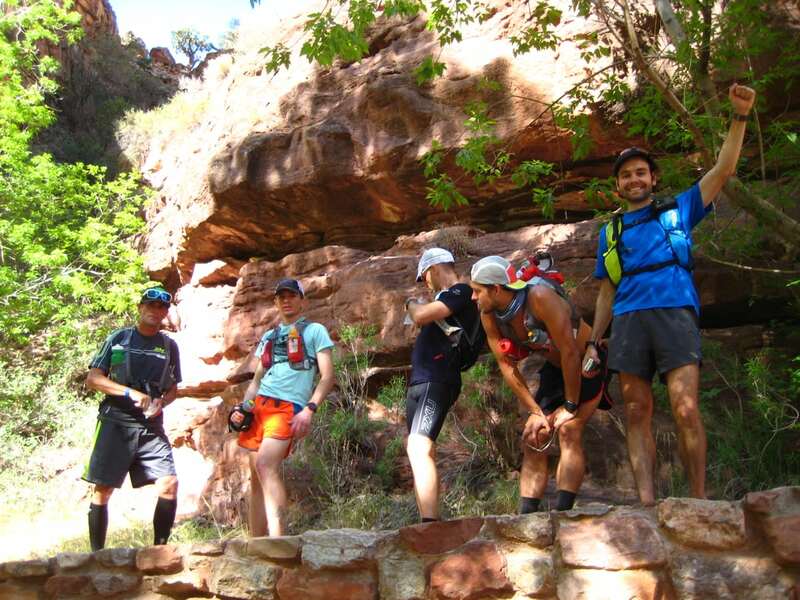 He tells the history of the trail, talks about people who had been the fastest. It blew my mind that someone could do that. At that moment I thought, I want to do that. I wasn’t running at the time or anything—I was taking walks. But I thought that those were the types of things I wanted to do. I had a new life now. I didn’t know if I was going to live or die. Now I’m doing well, and I wanted to pursue these things before I couldn’t anymore. That was an original motivation, hiking the Appalachian Trail. And I wanted to be the fastest. Then I started looking around and read about running across the U.S. I think all these things I was thinking about—I mean, they’re huge efforts, they’re adventures. That’s how I started thinking about it. I wanted to pursue adventure through the use of my body. It was less about actually doing an ultra, which I didn’t even know existed, and more about getting to a place where I could do those things. I ended up ordering an ultrarunning book, and the first thing it said was, ‘You should probably run a marathon before an ultra.’ That progression made sense to me. I thought, Before you run a marathon, you should probably run a half marathon, or a 5k, or just start running [laughs]. I started to run, a little bit at a time. iRunFar: How did you like running when you first got started? DeNucci: I started to run around Minneapolis. I got to explore my surroundings. I would go run seven miles out without nutrition, I didn’t know where water fountains were. Uber and Lyft didn’t exist, let alone I probably didn’t have a cell phone on me, and I’d run and basically just bonk and have to walk home. You just don’t know what you’re getting into. But I loved it. I loved the exploring, and seeing the city, and being on foot, and seeing progress. 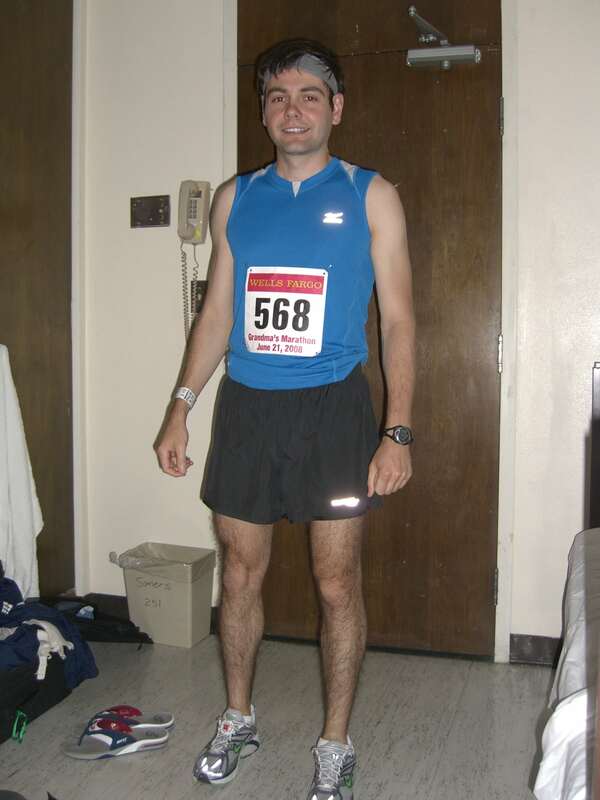 So, I eventually started training for a marathon and ran my first marathon in 2008. I built from there. I wanted to qualify for Boston, then drop my marathon time, and I got caught up in the goals, the process. In 2008, DeNucci ran his first marathon. iRunFar: It sounds like you enjoy the process of things—the process of studying and learning, the process of running and seeing the benefits. DeNucci: [laughs] That’s probably why I’m still in school at 37 years old. Yeah, it’s all kind of the process. In the end, you have this idea that the process is building toward one thing. But so many times in my life I’ve realized that there isn’t that one thing. There’s always something else. You do all the training, you do that race, the race is done, and life goes on. Now, where are you? If you don’t enjoy the process, I’d say it’s a lot harder to stay in a sport like ultrarunning because it requires a lot of sacrifice of time and energy. Then the races themselves can be especially punishing [laughs], but in a good, a type-B-fun way. iRunFar: It’s almost like running 100 miles was just further pursuing the process for you. DeNucci: If I look back at why I started running, it was about pursuing adventure and exploring the world around me. The motivation was these huge efforts. It was set in that context of allowing me to do big efforts, which I thought would give me a sense of accomplishment and adventure. I kept that progress because I had always wanted to do bigger stuff. So, I took the next little step and ran a road 50k [at the 2012 Mad City 50k]. You were there, we raced each other! DeNucci: Then I ran a trail 50k in Minnesota. After Minnesota, I came out to California for a radiology residency. When I came out here, it was perfect timing and the perfect place to be for someone getting started in the trail and ultrarunning scene. San Francisco Running Company had just opened up, and they were still a small operation. I got there and Jorge [Maravilla] recommended this straightforward run in the Headlands that almost killed me [laughs]. There were these climbs and descents I totally wasn’t used to from the Midwest. Then Jorge kind of showed me Western. I paced him the year after I moved to California, in 2014. When I experienced the race, I thought, This is something I have to do. 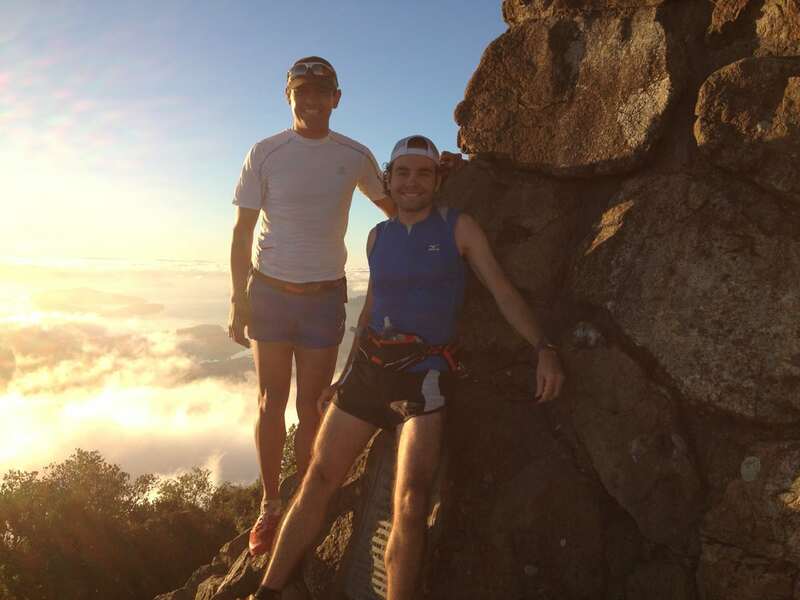 DeNucci summits Mount Tamalpais in California with Jorge Maravilla for the first time in 2013.
iRunFar: It seems like doctor types tend to have a really committed drive, and they pursue their interests really fully, almost like type-A personalities. Do you think you fall into that category? DeNucci: I kind of struggle with that because I’m not sure that I’m a classic type-A personality. iRunFar: I should have added: no type A thinks that they’re a type A.
DeNucci: [laughs] That is true, that is true. The things I get involved with, I like to pursue them as far as I feel like I can. But I also think some of that ability, at least in my case, to be able to have some success, is to learn to go with the flow and be a little more relaxed about the path that you take to get there. That’s how I’d say I differentiate from a classic type-A personality. Like, I’m not so regimented where every t is crossed and i is dotted. I would say I hold myself accountable and work hard but, for example, if you look at my training plan, it’s more free-form than what you might find with a true type-A personality. I’ve found that being very strict about the way you do things can be very challenging. I’m more [laughs]… behind the scenes it feels much less stressful. iRunFar: You’re rigid in terms of your goals but you’re more flexible about how you get there. DeNucci: Yeah, that’s the way I’ve been able to succeed. Nothing is how you expect it to be or want it to be. I’ve seen people who are very type A who get really frustrated when something may change quickly at the last minute. If you’re very stuck on doing things a certain way, or you need to do something a certain way, you may have a lot of trouble adapting to that situation. And life is basically completely unpredictable 100% of the time [laughs]. I think it’s hard to be very strict and regimented about something because it can be unproductive in the long run. iRunFar: How important do you think that flexible approach to goals and to life is for your success in ultrarunning? DeNucci: I think a lot of people who have success in ultrarunning, that’s a big part of their outlook on things. You are kind of constantly in the situation that you are in, at any moment. You have to be able to move on from there and not think about where you came from. You may have a big, grand plan about what’s going to happen that day, and five minutes into it things change. You have to be able to instantaneously say, Okay, things are different now, I need to be able to change. You get caught up by these little things in the moment, but I try to keep a sense of the bigger picture: everyone is running through the same thing and everyone is running slower and it’s going to be a slower day. It’s more of that free-form style than trying to stick to something regimented. In ultrarunning I think it’s important to be malleable. I think that’s a good quality to have in life, too. 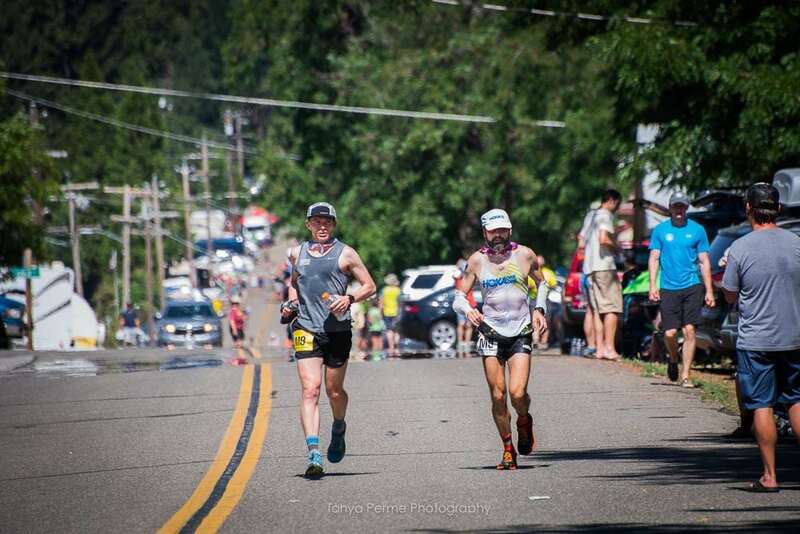 iRunFar: What’s allowed you to develop that racing strategy? DeNucci: When I started with road marathons, I was very scared that I wouldn’t finish. I tried to figure out all the rules, how many gels I should take, how much water, and over time it becomes almost intuitive. I don’t think about it all that much. It’s almost like you end up on auto-drive: you’re in the moment and you execute a plan without having to think about it. You know what’s right in the moment. I think you see it in a lot of people that have raced ultras for a long time. I think it’s more of my—it’s from experience, and maybe it’s the way that I race because I started running later in life, and I didn’t have formal training in it. I guess it allows me to bring a more mature perspective. I don’t really know. I guess some is experience and some is the way I deal with the world in general. It happens to translate pretty well to ultrarunning [laughs]. DeNucci ran across the Grand Canyon of Arizona and back in 2014.
iRunFar: Is fear something that motivates you in running? DeNucci: I remember, when I first got into running, I ran a half marathon as preparation for a full marathon. I remember I finished that and the first thing I said was, There’s no way I could do that all over again. That’s impossible! How could anyone do that? I think there’s this little fear that we have when we set these goals. When it’s something we haven’t done before, we have this fear that we can’t do it. I’d say what’s motivated me sometimes during a race is fear maybe of failing, but maybe fear of not sticking to things I said I would do. I remember in my first marathon, at mile 25, I was just dying. I wanted nothing more in the world but to start walking [laughs], which would have been fine. But a little voice in my head said, You told so and so that you were going to qualify for [the] Boston [Marathon], and you don’t want to tell them tomorrow that you started walking at 25 and you were on pace. I don’t know if it’s a fear of letting others down, or letting yourself down—that’s something that maybe motivates me during a race. I think we all come in with fear. It’s a good thing but it’s finding how to use that fear to your advantage versus letting it beat you down and scare you away from maybe reaching that next level that you never thought you could. I think that’s one big thing that a lot of people learn in ultras: you can do a lot more than you thought you ever could. iRunFar: As you’ve gotten more into ultrarunning, how have you been able to balance the training and racing with your work as a radiologist? DeNucci: I think we find time for the things we want to do. I have a busy work schedule, but I don’t have kids and I have a work schedule that I’m able to fit my running around at this point. I think a lot of people would say that the busier they are, the more productive they are, in terms of getting things done. So, having other stuff going on outside of running is beneficial in that, when you do have your free time, it makes you plan a little more and squeeze things in. I think being busy can actually make you more regimented about getting your runs in. Then, I think when your running isn’t going well, it allows you to still maintain a healthy life. Everything in your life isn’t focused around your running. I think that can be a workable lifestyle, but for some people, mentally, it’s nice to have different aspects so that you can have productive parts of your life when running isn’t going well. And, finally, I think it probably prevents overtraining because you physically don’t have the time to overtrain. 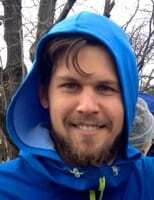 iRunFar: I think almost everyone with a beard has a story. What’s yours? DeNucci: I do have a story [laughs]. It starts with the fact that I couldn’t grow facial hair until age 19 or 20. I was a late bloomer. But as I started getting more into the ultra community, it was the time of Rob Krar winning Western, and killing it out there, and so the ultra beard was hot. I had started growing some stubble out for my first 50 miler. Coming from a road marathon background, you have this mentality that you want to cut as much weight as possible. You don’t want extra hair holding you back, so I shaved right before the race. I was clean shaven for my first 50-mile race. Jenny [Maier], my girlfriend, was going to crew me. I think I told her that I shaved and she said it was bad luck, that I should have kept the beard. I thought, Maybe I should do that next time. I was super happy with my race there. But from then on, I decided I would grow the beard out. Since January 2015, I’ve had a beard. 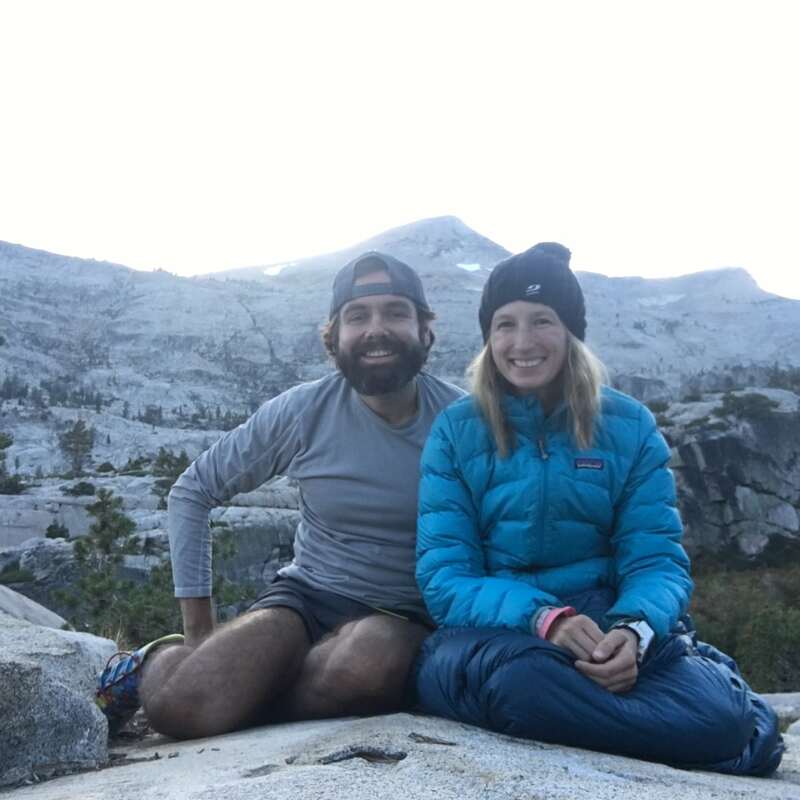 DeNucci and Jenny in the Desolation Wilderness of California in 2016.
iRunFar: What’s the next part of the process for you, with life and with running? DeNucci: The cool thing is that I just started a musculoskeletal-imaging fellowship. The part I really like is that it’s a lot of sports imaging. We do a lot of imaging for the [San Francisco] 49ers, and the Stanford athletes. I just started and I’ll be finishing in June 2018. It’ll be the end of a chapter but a new beginning. I’ll finally get a real job next year. After all these years of training, I think I’ve found a specialty that encompasses the things I like in medicine, and being able to help people, and also a content area I found interesting, professionally and personally, in athletics. It’s allowed me to put that altogether. On the running side, I don’t know. Western is slowly—I’m getting it figured out, what things I need to do to prepare myself. That’s been fun to tinker with my training the last three years, and how that’s changed my performance over time. I’d like to pursue that again, and as far as I can, with Western. If I’m healthy next year, I’ll be back. Other than that, there are so many other things out there. I still think about doing the transcontinental run. But I don’t know, I don’t have it all figured out. You know, it’s also inspiring to see someone like Rickey Gates go across the country, but not for a time—going out there and just exploring the world around him and learning about individuals. I’ll find wherever I am in life at that time, if I’m really wanting to accomplish a goal, and beat a record, or trying to beat a record—maybe that’s what’s motivating me. Or training at a level where I can pursue a long adventure. One of the next steps would also be to pursue some races internationally. iRunFar: You’ll find another big adventure, it sounds like. DeNucci: Yeah, but who knows what it’ll be. It’s been kind of interesting to reflect on [my life] through this interview. Our lives are so linear, or they appear so linear, but there are a lot of ways that you get here that are unexpected. You don’t always piece it together—you don’t piece it together at the time, but looking back you can create the story, or understand the story better. It’s been cool for me to reflect and try to put things together. I think I’ve been able to figure out, from my childhood until the time I was really sick, how everything came together. Back in the day, DeNucci enjoying a Wisconsin summer. Thank you for that, just wonderful! Terrific interview, a sharp cat, always rooting for Chris!